muddle — all designed to blind-side the voters. Crikey said the briefing was written by Hockey’s media adviser, former The Australian Financial Review journalist Gemma Daley. When I followed a link accompanying the meme above I found the Crikey story. It was written by Bernard Keane and Glenn Dyer. The two journalists then proceeded to pull the Treasurer’s Briefing Note to pieces. 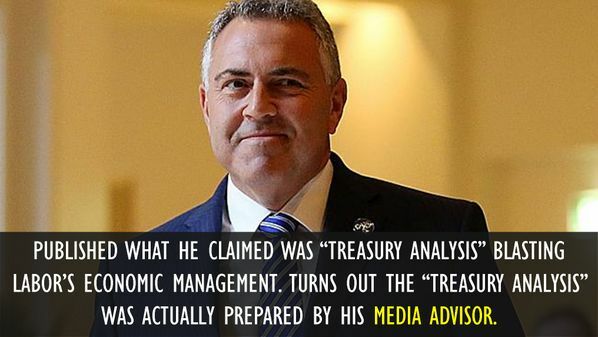 He may not have written it but, as the issuing Minister, Hockey’s responsible for it. doubt they count on it. the previous Labor government for that. more mass transit and light rail. ahead of budget ‘hard decisions’. Hilarious! Hockey: As we approach the Budget, more and more evidence emerges of what was left behind by our predecessors. the Budget would be in deficit for a 16-year stretch. Kirk then spoke to Labor’s Treasury spokesperson, Andrew Leigh, who said the Budget position was to a large extent of Joe Hockey’s own making. Budget back in surplus in 2016-17. There’s more from all parties in the ABC interview. Rupert Murdoch’s The Australian, reported on the Briefing Note on April 1. Unfortunately that story is behind the paywall. The URL in the Google search result says the story is “premium content”. Ha! erudite comments from a Murdoch propaganda hack. Note with the contempt it deserves.